I haven't visited Waikiki for a long time. the sunset I can see here is beautiful as anyone knows. The classes at KCC started last week. KCC is the initials of Kapiolani Community College. kept his eyes front and seemed to overawe others. I hope we'll keep in touch as before. 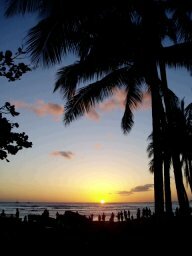 Anyway, I returned to Hawaii on January 6.
it arrived at Honolulu airport taking 5 hours and 45 minutes. 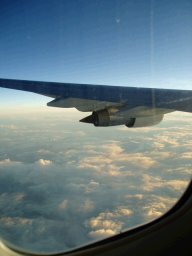 As soon as I got off the plane, I felt I was full of life. My new journey starts again.